Recent performance is well within historical ranges for rolling 1-year, 3-year and 5-year intervals. The probability of market underperformance is only 28%, 13% and 7% for 1-year, 3-year and 5-year intervals, respectively. Equal allocations to the value, momentum and low-volatility factor portfolios is close to optimal for a three-factor strategy seeking to maximize Sharpe ratio. However, the minimum volatility solution is a 100% allocation to the low-volatility portfolio. On stand-alone basis, the operating profitability factor portfolio and the investment factor portfolio each outperform the market. However, based on conventional performance metrics, they are less attractive than value, momentum and low-volatility. Equal allocations to the five factor portfolios, rebalanced monthly, offer little or no improvement over equal allocations to the value, momentum and low-volatility portfolios. Size (small market capitalization) is not attractive from a factor perspective, but outperformance of equal-weighted factor portfolios relative to value-weighted portfolios suggest that size is a catalyst for most other factors. Investors probably cannot usefully time factor exposures. Long-short factor portfolios are superior to long-only in theory, but practical considerations (such as costs) make the latter more appropriate for most investors. Factor premium allocations work for stocks globally as in the U.S. Factor premiums apply also to other asset classes, such as corporate bonds and commodity futures. The following chart, constructed from data in the paper, summarizes annualized gross outperformance of the broad U.S. stock market for seven long-only factor portfolios and four sampling approaches. Five of the seven factor portfolios are standalone value, momentum, low-volatility, profitability and investment portfolios as specified above. The other two are multi-factor portfolios: VML-EW each month makes equal allocations to the value, momentum and low-volatility factor portfolios; VMLPI-EW each month makes equal allocations to all five factor portfolios. The four sampling approaches involve either the full 1963-2014 sample or a 2010-2014 subsample, and apply either equal weighting (EW) or value weighting (VW) to the stocks within each factor portfolio. Most of the five standalone factor portfolios add value on a gross basis, both overall and recently. 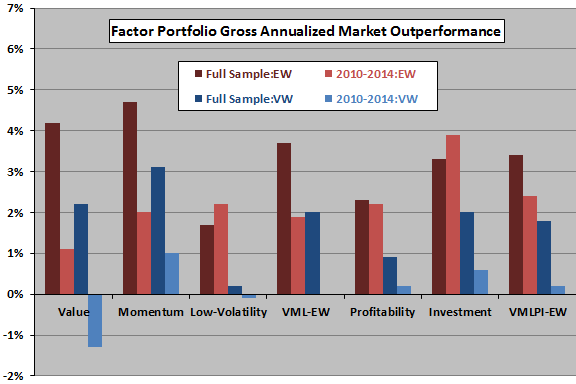 Recent performance of factor portfolios is mostly weaker than overall performance. Equal weighting of stocks within factor portfolios always beats value weighting. A five-factor allocation strategy adds little or no value beyond a three-factor allocation strategy. In summary, evidence indicates that stock portfolios designed to exploit factor premiums systematically tend to outperform the broad market on a gross basis. As noted, reported factor portfolio performance is gross, not net. Accounting for annual or monthly factor portfolio reformation and for monthly multi-factor portfolio rebalancing would lower performances in all tests. Assessing portfolio reformation frictions, which vary across factors and over time, is complex, potentially affecting the relative performance of factor portfolios. Turnover is especially high for the momentum portfolio. Data acquisition/processing and trade execution as specified is beyond the reach of many investors, and delegation of these tasks to an investment manager involves fees. See “Harvesting Equity Market Premiums” for a summary of the original study.